Clint: Today I’ve got lovely Jenny on the call and she’s all the way from Sunny Queensland in Australia. How are you today Jenny? Jenny: Good, thank you! How are you Clint? Clint: I’m great! 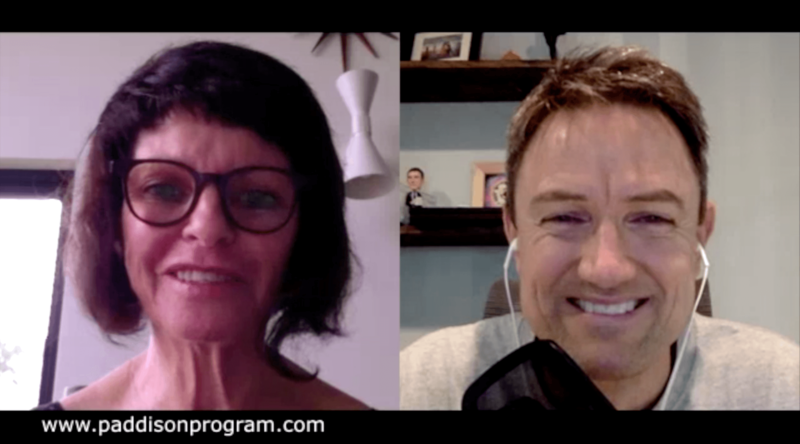 And as always, I’m thrilled to be able to share with our audience your fabulous story and improvements on the Paddison Program and I look forward to hearing this myself since we’ve done what I’d like to do which is withhold all the juicy bits until we go live so that then I can experience it with the audience. So just to give us a sample of what we’re in for, tell us how far have you become, what’s your sort of before and after situation? Jenny: My before was… pretty well I had a really bad feeling that I wasn’t going to get any further in my life. I couldn’t walk. We had lots of stairs in our house. I couldn’t walk upstairs. I said Oh my goodness is this my life you know. Is this what I’m going to be like. And I had a walking stick. So it wasn’t very nice. And then my husband found the Paddison Program for me online and I said well I’m going to try this. This sounds fantastic. This is like the life of me under my tunnel so to speak. So yeah. We started. 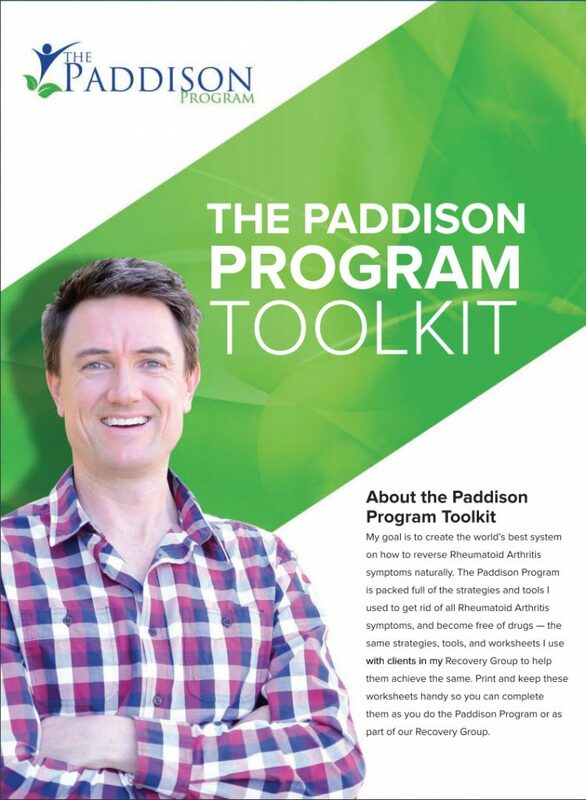 I started the Paddison Program, I was very strict with it. I didn’t sway either way. I stuck to it. I just didn’t want to do anything wrong because I wanted just to get better. That’s how I started. Clint: And compared to where you were before. How are you now? Jenny: Oh I can walk I can drive without fear of getting run over. I can you know I get to exercise. I lead a real and normal lifestyle. Jenny: So before I wasn’t. So much more. Clint: Awesome. OK. Fantastic. Well what happened. How did it all sort of break down in your body originally and I believe you have psoriatic arthritis so explain to me you know how this all started when it started and how quickly it progressed. Jenny: Well it started probably in about 2014. I had swelling in my knee and I thought I had meniscus tear and my doctor sent me for an MRI and that was then the result was meniscus tear. I had tried physiotherapy but that didn’t work. So I went to see a surgeon and he said I’ll go and have a look you know it looks like you got a pretty big chair there. So I operate and he operated. And when I was supposedly getting better I just kept swelling and so I get back to him having cortisone shots and drainage in my knee. And she said I will go and again I don’t normally do this but will go on again just in case I’ve missed something. So he went back in again. There was another small tear that I just didn’t get better. And then my left knee swelled up. So I basically couldn’t talk without (inaudible) and started to go and see a rheumatologist you recommend me to a rheumatologist and the rheumatologist said look you know I did the test. You’ve got psoriatic arthritis. And I thought thank goodness I haven’t got rheumatoid arthritis. I can’t be as bad as rheumatoid arthritis. Yes, it was. Clint: Yes it is yes. I see. psoriatic is just rheumatoid plus psoriasis. I just see it as the same disease plus something else. So certainly by no means is it less as I said I think you’ve got a couple of things going on there. So did did you see so psoriasis showing up as well for that diagnosis or how did he know. So did you ever have any psoriasis on your skin? Jenny: Right. And so we diagnose you with say psoriatic because it was asymmetric or what was it. Jenny: No because it wasn’t asymmetric but because he did the drainage on my knee and hand my fluid and my knee tested he also did bloods I didn’t show any RH. Jenny: I’m here at all. And so that’s how he diagnosed it. That time. I think fluid in the knee when he diagnosed that. And he said yeah I know he said that. He said it was a really hard thing to diagnose. psoriatic. Arthritis because it doesn’t have that rheumatoid factor you. And he said I’m gonna put you on sulfasalazine and so he put me in 25 milligrams and first and then I started taking some sulfasalazine and I ended up in hospital in a really bad reaction. I was in quarantine for six days. I ask for my white blood cell count which I had (inaudible). And then I had to have injections to see my white blood cell count back again. Clint: Now what did the doctors attribute all of that to?. The Methotrek the sulfasalazine or the prednisone? Jenny: oh sulfasalazine I was allergic to sulfur. And I explained that to my rheumatologist. They said lets just give a go shall we. And next thing you know I get a phone call saying don’t go anywhere stay inside don’t go out of the house. I’m sending you to a hematologists and we’re going to get your blood checked and we need to go in the hospital. Clint: Now that call must have been triggered by him receiving an updated blood test and looking at the results. And then you know basically it’s a red flag has been raised with your white cells and he’s made that call and said get to the hospital. Wow OK. Wow. Right. OK. So this is fascinating and horrific So what happened next. Jenny: And I said to my husband I don’t go back on any medication coz the next one was methotrexate. And I also had hepatitis in the past I was a little bit worried about the liver damage. Yeah. Yeah. So he said I found this program online. It’s called the Paddison program. Maybe you should look into that. And I thought yes you know that’s where I’m going to go. And I knew that diet would help me. I just had this feeling about it. And I also asked rheumatologist about diet and he said no that doesn’t say anything. You know i’ve really proved him wrong. I had just been like can I ever think somebody else after that. Yeah. So I just came ahead and lakes and bounced pretty much. I took me two years to get off the prednisone. Clint: Oh now I want to explore that a little bit more in a second. I very much want to explore that. Okay so in terms of your drug usage you obviously didn’t go back on sulfasalazine and you were scared of the methotrexate So you just stayed on the prednisone you came out of the emergency room and you just stayed on that and you followed Paddison program and that’s what you did. Yeah. For the last two years is that correct. Jenny: And she started taking my blood but it wasn’t till the end. Every time I’ve been on the Paddison program six months and I started getting my blood taken there where you know when with my rheumatologist I just I wasn’t aware of it. Like the crp that you know well I wasn’t aware that until I saw your program. But I I just wanted to really concentrate on weaning myself off prednisone. And get better. So that’s what I did. I went down half a milligram but that didn’t really work. I just I just had to keep going back up. And I got an infection and then I had to go on antibiotics and that kind of like put me back up again to Five milligrams. So then I started going down by quarter. And it took a long time but it got me off. Clint: Wow. Fascinating. So you were using a tablet cutter to cut them into a quarter. Yeah. And so let’s explore this a little further because there are a lot of people in your situation. It’s a very challenging situation to be on prednisone and you’re addicted to it. I mean not in a bad way. It’s only a bad way but I mean like you’re not it’s not that you’re not wanting to be on it. Do not I mean like you’re trying to get off but it just this does the consequences of the lowering are such that it’s very difficult to get off. So how long did you wait until you were steady again after each quarter milligram dose like what was your general approach here. OK. So round the world a lot of countries don’t use the word fortnight. That means two weeks rolling so you would drop a quarter. You would wait two weeks and in that two weeks you would resettle yourself and adjust and then you would make any adjustments to your diet make it more simple if you needed to exercise a bit more. I’m guessing you’re nodding. So good. And then you would maybe do another quarter if you felt up to it. Is this correct. Jenny: It Right. I mean if I had swelling I probably would delay it a few days. You know I have reset my diet and then I am going to go down. You know when I start you know that quarter it was sad I didn’t want to think it was you know I wanted to be sure that it was the diet I was swelling. And not the prednisone. Clint: Yeah I mean I absolutely did. That’s why I never. That’s why I never took painkillers at all and I never took prednisone. Thank God my rheumatologist doesn’t believe in it and I’m sure you can appreciate why having tried to get off it for two years. And also I never even took if I ever took painkillers that were natural things like curcumin I would only ever take it in a consistent fashion because if you take it sort of willy nilly or haphazardly then you’re constantly interfering with the feedback mechanism of the pain relating to what you’re eating. And so you get confused. And so my guidance to people with things like supplements like curcumin is if you if you really want to take them to to get some pain relief I only recommend them as a way to try and get off to something else that’s worse. And then once you get off that thing that’s worse the pharmaceutical then try to get off the curcumin as well because all the pain relief we need comes when we have a sensational diet great exercise stress reduction and a perfect microbiome. So all so much can be done without the supplementation. Right. So now did you have any emotional up and downs when you were trying to get off the prednisone. Jenny: No not really. I you know my emotional level things like I didn’t get depressed anything like that. But I think I got frustrated because you know I probably go down like maybe 10 milligrams and then something would happen you know like i got this infection and then i have to go back up again. And then I had to start all over again because I was I was doing half a tablet you know i have to go back to a quarter tablet. Yeah. I just want to get off it. but you got to be patient and realize that you will get off it just takes time. Clint: OK. All right then where are you now with regards to your medication usage and your pain levels. Jenny: Ok. I don’t take any medication whatsoever my pain levels are pretty good. If ever I get pain it’s probably more. That physical thing you know I have my twist my knees sometimes. I have been to bikram and I twisted my knee a couple probably a month or so ago. And then I go back. I had to go physio and then I went again a couple weeks ago and I did the same thing again not how I’m doing it now. Yes. And that’s my good knee. That’s not my knee that i had the operation. Clint: Right. So in terms of in terms of autoimmunity you would say that you don’t get what people call flares or what I call reactions to now the foods that you’re eating and your lifestyle. Jenny: Well my food my diet is still quite basic you know I do produce things every now and again and I know pretty much straight away at that thing. I do still get flares you know in that sense if I eat the wrong food w Yeah. But I’m so careful I don’t really. Clint: Exactly right. So. So you know that as long as you play by the rules that you have confidence and control over your situation is that correct. Clint: So that’s pretty good compared to you know being with the walking stick and having the two blown up knees. I mean. Jenny: It’s just amazing. Like I’m living a normal life in on you know so I can’t thank you enough this program just you know there’s like I said the light at the end of my tunnel. Clint: Awesome. Yeah. Well that’s correct. Clint: Yeah. You’re very welcome. This is this is the greatest thrill for me is to be able to meet yourself and people like you and hear your stories and it just gives me the greatest buzz because I just think wow you know this is you know it’s not just about sort of you know helping people who are a little bit. It’s about total transformation of your set for the rest of your life. Now as long as you know stick. Close to what works and you don’t go eat and cheese pizzas every weekend. You’re going to be you’re going to be sweet you know. And the fact that we can actually say that and believe that is absolutely remarkable you know I don’t know if I have much many medical practitioners in the area of Rheumatology who watch these recordings and listen to my podcast or on my mailing list or whatever but they would if they’ve first come across these kind of conversations they would be like oh no you can’t say that this could totally come back and this is you. You’re just in a temporary state and stuff. And that’s not true. That’s not true. i’m going on. I don’t know if it’s five or six years. No problems like I consistently defy what is considered medically impossible. Clint: That’s not going to change. It’s not going to change because the awareness that I got going through the healing process occurred over many years. It wasn’t like I think I know what caused that. I can just pinpoint every aspect of the whole thing with the exception of the last little bit where I introduced three things at the same time. It was my only mistake. I introduced oatmeal orange juice and potassium supplements all at the same time. And that extinguished the last bit of my smoldering of inflammation and I’m almost certain it was from the oatmeal but potassium supplementation has been studied to help rheumatoid folks and also the orange juice is also high in potassium. Surprisingly enough. And also you know the Vitamin C can contribute as well. But you know I think let’s face it it’s always the food isn’t it. And it’s all. And the oats just got so many benefits for stimulating lactobacillus bacteria and I just you know there’s a whole podcast about that. But anyway so it’s just so great. Clint: Well first of all before we say what next and what you’ve got planned Can you tell us some tips. What would you say. How would you encourage others if you’re able to sit down with them for a few minutes. And what would you say to someone who’s on the fence or let’s talk about people are on the fence and then we’ll talk about people who are struggling. Jenny: Yes. I think you first of all you o give it a go. That’s the first thing to do. And I think you need to follow the instructions so to speak you know to the T because I really believe that she can’t sway them. You know you got to do it you got to do it. I mean that was you know I didn’t have any choice. I just felt like you know its either this or the drugs. And this is a much better alternative. plus you have to be really patient. And also when introducing foods you get to realize that you know you’re not the same as everybody else because I know that you introduced oranges and try oranges but I haven’t been able to eat oranges and potatoes I can’t eat potatoes. You know like everybody the same You’ve just got to take it you take it at your own pace be patient and just introduce foods one at a time and follow the you know the instructions at the different levels that you’ve got you know the introduction of the different foods at what stage if you’re on prednisone you got to understand that your gut won’t heal until you get off it. I’ve been off it. I’ve been nearly seven maybe eight months and I’ve only just started to see that my gut is getting better and then I can tolerate a few more things. So you know then that’s the big key I think. Clint: Yeah. Well that plays into exactly my existing knowledge and my teachings on that as well. Whilst your on prednisone you know you’re fighting with one if not two hands tied behind your back and it just consistently tries to undermine the attempts to heal the gut. And so you know I’m I’m extremely impressed and wildly excited for you that you were able to slowly get it down so low that you you know won the arm wrestle. You know it’s like an arm wrestle as you’re constantly battling. And it just you can you know those times you watch an arm wrestle and it doesn’t seem like anything’s going there’s two opposite forces and they’re barely moving and then eventually finally you start to get the leverage. And just getting off just a quarter at a time you got the leverage and then you won the arm wrestle and then now you’re able to see the healing take place. And now you’ve got that slow period once you get more and more foods in. It just gets easier and easier and easier. And then maybe once every now and then you still might feel like a little twinge or something like something’s not quite right. And if you get that you just reset back to baseline for one or two. Days and then you just resume wherever you were up to resume with all the foods and you should be sweet to get straight back where you were. So it’s exciting. And so any other thoughts. Before we talk about maybe what you’ve got planned for the future. Jenny: And I think so I just think yeah like I said actually got it okay. I rheumatologist at the beginning that she doesn’t wanna see me again. So that was amazing. Clint: How did that how did that go down. I mean there was the visit. Or was it just a letter. Jenny: It was a visit. And I had my CRP was under one and like actually it’s not pretty. So she said no. As far as I’m concerned here you know you’ve got no symptoms and you don’t need to come see me again. You can make an appointment just in case you know that you have a problem and then come back. But I canceled my appointment twice now so I don’t think I’ll be making any appoiments at all. But that was to me. i jumped up and down later. So happy. Yes. Clint: Yes. So what about your family. How have they been throughout this process. Jenny: extremely supportive I’ve got my husband doesn’t eat vegan. He you know that he is a lot healthier because of it. He eats all my food. You know like my salads I don’t like salads. They just I like salads herbs and watercress and beach erosion and you know all that good. And he has that every night pretty much every single night. And vegetables or stir fries that his delicacies. But it was well he would have him. Clint: His health would have improved by you know by proximity you know. Jenny: my girls cook pretty much a lot of vegan meals so yeah. They’re all on board. They’re all just absolutely you know nice that acceptance factor. So they’re very excited and really happy. Yes. Clint: And the rheumatologist did the rheumatologist say something like I’m going to have to get you in to speak to all of my patients and tell them to do whatever you’ve done and encourage every single person that walks into my clinic now to go on this Paddison program so that then I can reduce their medications make them happy or make them healthier to avoid future complications with other diseases. Jenny: Not she just give to me I think you got better because in fact that your white blood cell count many years ago they did test to find out whether they did like get rid of all your white blood cells that you could really boost your immune system. And she said maybe that had something to that’s what she said but I think she was a little bit more open than most rheumatologist. And she was very happy for me to get on with my diet. And you know she didn’t force me into taking anything. She said look you’re just doing things right. And you know I hate taking your bloods and we’ll just see how you going. So she was open in that respect. She was a nice person so yeah. Clint: That’s all we can ask for. You know they don’t you know when you go to someone who is a car mechanic and you start talking about how to grow flowers are the car mechanics and I can understand how flowers grow and if you try and tell them that they should shift their business to flower growing they’re probably not going to think that that that that’s something that they want to do because they don’t know anything about it. So fair enough. And what about what you got planned now. You got some exciting things planned. Have you got some trips planned or you feel more social you want to spend more time with some friends and family. Tell us what’s next. Clint: It’s remarkably good feeling isn’t it. I mean you know you come over something like this and it just makes everything else seem trivial. But I catch myself sometimes getting upset with some things like just I don’t know sleep behaviors with the kids or whatever it might be. It’s things that things that are not real problems they’re just part of being alive or being a parent or you know just living in a western kind a world and the problems that I sort of get bothered by and then I just think to myself hang on a sec. You know it wasn’t it wasn’t that long ago when I could barely walk and I was on a maximum dose of the methotrexate and I was going to bickram and yoga every single day just so that I could walk the next day. Being terrified of having to ever go out into state for any reason because I wouldn’t be able to you know have any security about being able to walk properly going to events hobbling and needing help on the stage. I mean it was a mess. Yeah. So yeah. Jenny: I have a different respect people that have you know wheelchairs and I have you and I understand struggles that they must go through every day. And I just I sometimes see people I think which is mystical and sticks out here. I just would like to let everyone know that you know this is this is an alternative and it’s a natural alternative and it works. You know it’s just doing his thing as. Clint: Wonderful. Well I’m so pleased that you responded so well to the changes that I believe in and I now see that you fully believe in and got results like I got. And that’s very encouraging for people who are relying upon these chunks of information for inspiration because the path is long and the path is slow and the path can be so frustrating. And every time we learn from someone like yourself who’s been there and been in the trenches and doing it the hard way it really does help to to get up the next day and exercise and eat the right foods and to continue to apply the discipline that’s needed. Jenny: And that’s a healthy person. Clint: Exactly. Exactly. It feels good if you know if you meet the criteria which many of us can meet to be bullet proof from having a heart attack to have virtually no chance of getting Type 2 diabetes or to eliminate it. If you can’t have it and all of the big list of things that that where we feel confident about not in a gloating way but just in a in a quite factual way just statistical outcome reduction isn’t it. Well here are the stats. You have these results. These blood markers. You’re in this category of risk. And if you eat a low fat whole foods plant based diet no junk food then you’re in the lowest category risk. Jenny: This time. Like I have my cholesterol level as like normal. Clint: It’s fantastic. But when I used to go to my rheumatologist it was actually you. I found it quite interesting. But he used to obsess about my cholesterol more than he did anything else. He’s like how did she get it that low. He said whatever you’re doing you should bottle it and sell it. And all he was talking about was the cholesterol. He was just fascinated by the cholesterol because he said it’s like the best cholesterol levels that I’ve ever seen, and I swear that’s all. He just was fascinated by it he really did find it remarkable. And I I just I just explained to him what I was doing and. And yeah. But it was always a fun thing for me to see his eyeballs pop out of his head at my cholesterol. It’s gone back up since I have expanded my diet. Now it’s just in the low range of normal. It’s not below normal anymore. It’s just in the low range of normal. And I found that interesting because now you know I guess you know I just eat. I just eat so much diversity now and not as much greens. You know I’m so so crazy about the Greens consumption and I believe that the Greens just seem to pull the cholesterol out. It just seems to tear it right out but not in it. I mean that sounded like a harsh thing but it just seems to lower cholesterol levels a lot proportional to dramatic amounts of leafy greens. Clint: And so when I just eased up on that because I didn’t have to as much to feed my healthy bacteria then I found the cholesterol just gently went back up a little bit like that. Jenny: And I think it’s because (inaudible) my diet now. (Inaudible). Clint: Yeah yeah. As you as the foods get just a fraction more processed and you get into those you know past varieties of things you burn the fuel quicker. So you end up wanting to eat more again soon. So in a day you actually end up eating a little bit more food which then you know the more calories obviously helps if you’re working on muscle gain and stuff to have the extra calories to work on. So it all you know at the hardest. The hardest part is the early stages. That’s the hard part. And then it just slowly unfolds. Clint: pain free feels better than cheese tastes. Clint: Yes. All right. Well fabulous. Well thanks so much. It’s been great to chat with you. And I’m looking out the window in the background. Clint: I can see a gorgeous big gum tree just blowing in the wind and it makes me miss home. So I appreciate being able to see that as well because you know the certainly the the landscape and the outdoors of Australia in my in my blood and I really do miss it. So it’s nice to see that tree. You’re living in obviously a beautiful part of the world. Clint: That’s right. Exactly. Well thank you so much Jenny. This has been lovely especially at an early time [8:00] AM there in Australia. So thanks so much. I look forward to keeping in touch. We’ll talk again soon. Jenny: Thanks Clint have a good day. What a thrilling story Jenny. I have only skim read the above interview but hope to read in detail later. I too had a psoriatic arthritis diagnosis. They didn’t know what it was at first because my psoriasis was never very prominant. Anyway I was started on prednisone (over 14 years ago) and weaned myself off after being on it six years when I had a spontaneous fracture in my toes which led to the end of my working days (I was nearly at retirement age). Some years before this my GP had ordered me off work for three months and to do nothing or she said I would end up a cripple for life. The swelling and pain in my wrists and fingers was terrible, some in my other joints thankfully not all. The rheumatologist tried me on sulfasalazine and I had a really bad allergic reaction, reluctantly she put me on methotrexate. This was the worst decision of my life but so many friends pressured me into it. “Quality of life is better than quantity ” they said. Thanks to being a vegan for the last three years and a vegetarian before that for many decades, when I heard about Clint Paddison’s program it made sense and started it and as I was already been doing many of the right things it got me off to a good start. I was extremely interested and excited that it was possible to get off methotrexate, I had been so ‘brainwashed’ you might say that I would be a cripple for life. When I listened to Clint’s story and his TED talk having had bad RA and now off methotrexate I wondered if it would work for psoriatic arthritis. I was determined to give it a try. I had to change my rheumatoidologist though because the one I had at first wouldn’t hear of such a crazy idea. (Unlike you she just wanted me to keep making appointments for life). The next doctor let me start reducing but was very sceptical. At the beginning of this year 2017 and pretty much following the Paddison Program from scratch I was slowly able to reduce the methotrexate over an eight month period. On my last visit to him I was down to 2.5 weekly. Almost in disgust, he commented you may as well be off it, and said “Let your GP handle it from now on”. Oops if only our dear doctors would really listen to their patients stories! My GP was supportive of my following the Clint Paddison Program.THE RESULTS: Now totally off methotrxate for two months going on three; absolutely pain free for the past nine months; no psoriasis at all; best of all I have ALL THE ENERGY of a teenager again and no shortness of breath climbing stairs. I have a life again and I also give praise the great Physician’s healing power.